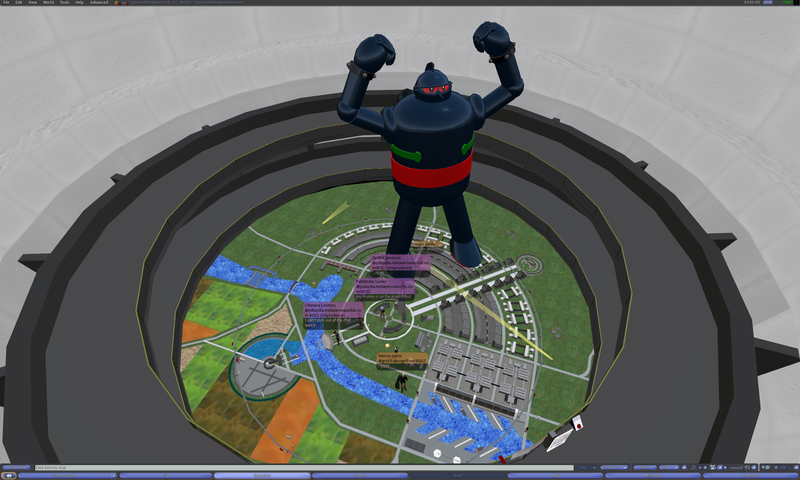 In today’s two meetings we explored a recreation of the 1939 New York World’s Fair on ReactionGrid, featuring the iconic Trylon and Perisphere. 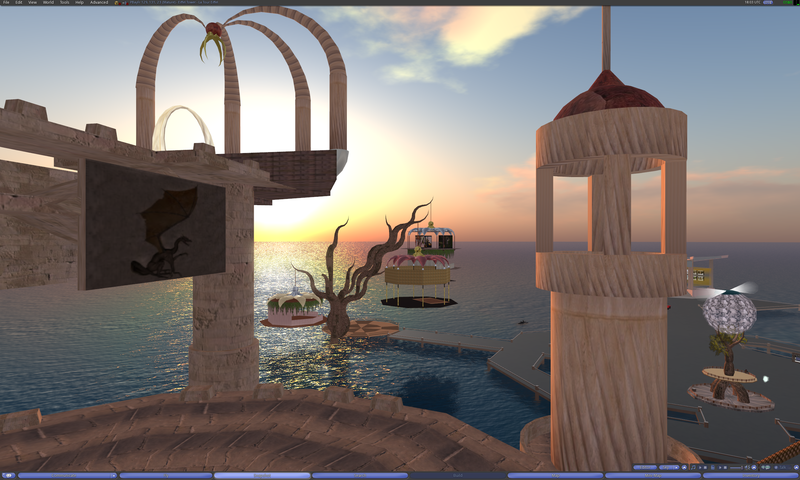 We also took a trip to LexGrey Barbosa’s new region on FrancoGrid, which he hosts from an OpenSim server in his home. Read on for a full transcript and many photos. 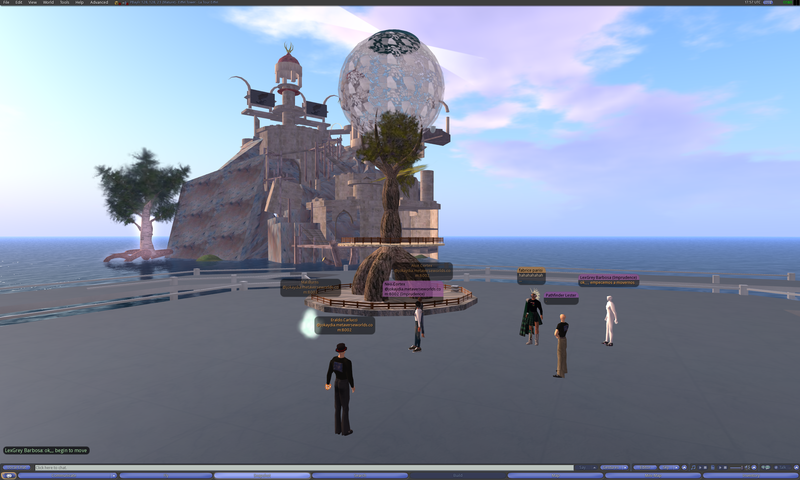 Our first tour of the day was of LexGrey Barbosa’s new region on FrancoGrid. 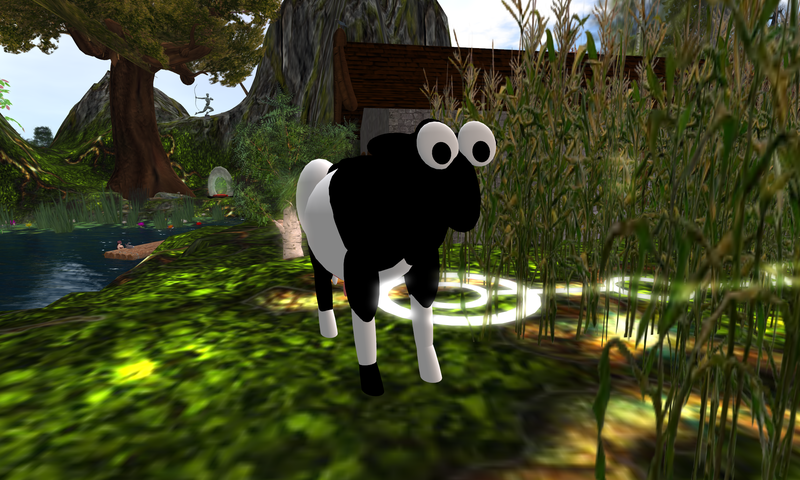 LexGrey is from Spain and originally had a home on a Spanish OpenSim grid. Unfortunately, a fire in the data center destroyed the grid’s servers. 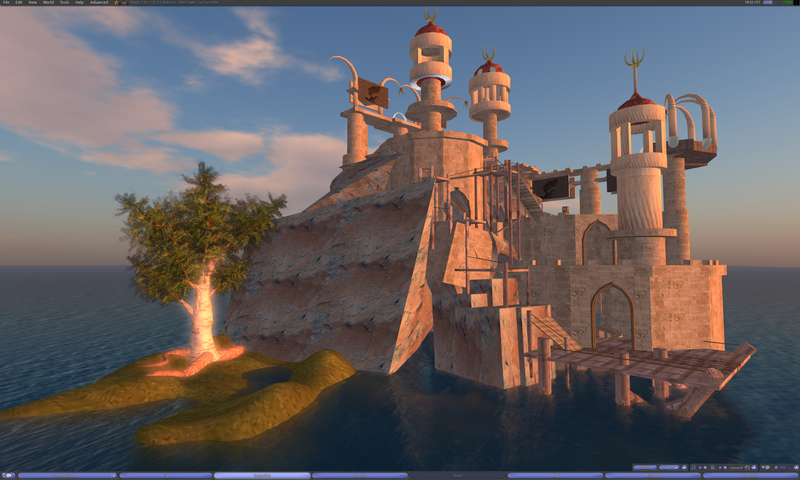 He has set up a new home on FrancoGrid, and his region is hosted on a computer running in his home. 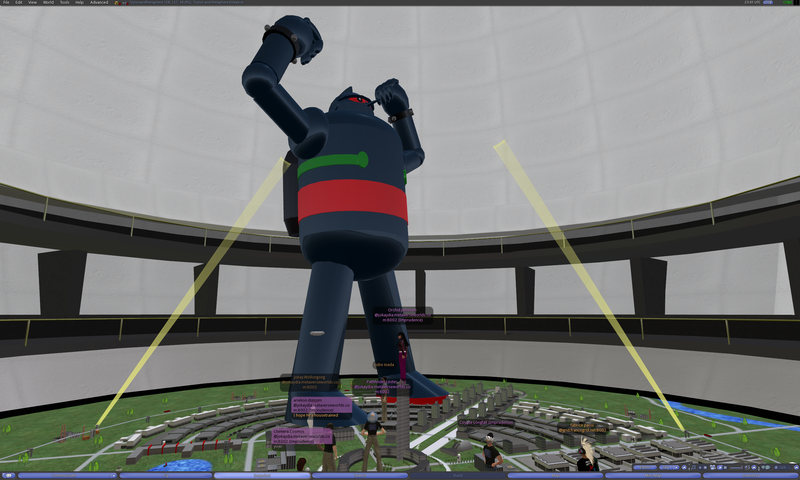 Our second tour of the day was of a recreation of the Trylon and Perisphere, one of the very first builds on ReactionGrid’s public grid. The Trylon and Perisphere were the central structures of the New York World’s Fair of 1939. Connected to the 700 foot tall Trylon by what was at the time the world’s longest escalator, the Perisphere was a tremendous 180 foot diameter sphere. Inside this sphere was a diorama called “Democracity” which, in keeping with the fair’s theme “The World of Tomorrow,” depicted a utopian city-of-the-future. Pathfinder Lester: it might be the hamsters, jokay. they invaded Pathlandia yesterday. Jokay Wollongong: awww too cute! Anastasios Aurotharius: I was just there…. Pathfinder Lester: yes, the Kraken. fighting the pirate ship. Pathfinder Lester: the hamsters are closing in on the kraken too. i expect an interesting battler will ensue shortly. Anastasios Aurotharius: is that what octopy eat? Anastasios Aurotharius: are reindeer hard to make? Eraldo Carlucci: Path….are you going for a TGIF theme? Pathfinder Lester: i cant remember the last time I’ve been to that restaurant. so I don’t know if my region here looks like it. 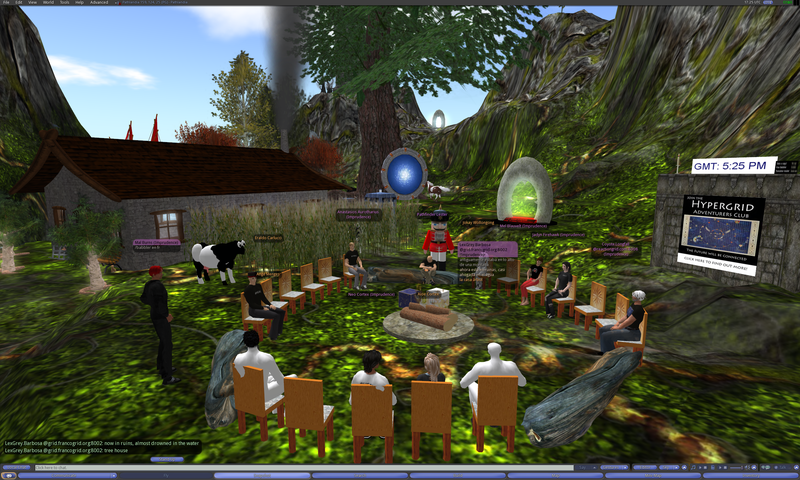 Pathfinder Lester: welcome everyone to the Hypergrid Adventurers Club. thank you all for coming today. Pathfinder Lester: and if there’s anything you say in open chat that you do NOT want on my blog, just say so in chat and I will redact your comments. Eraldo Carlucci: President Virtual Event Planners International. Mission is to help companies choose the right VW platforn for their business needs. Mel Blauvelt: Philosopher, interested in interdisciplinary thinking, critical thought, computer graphics and data analysis. 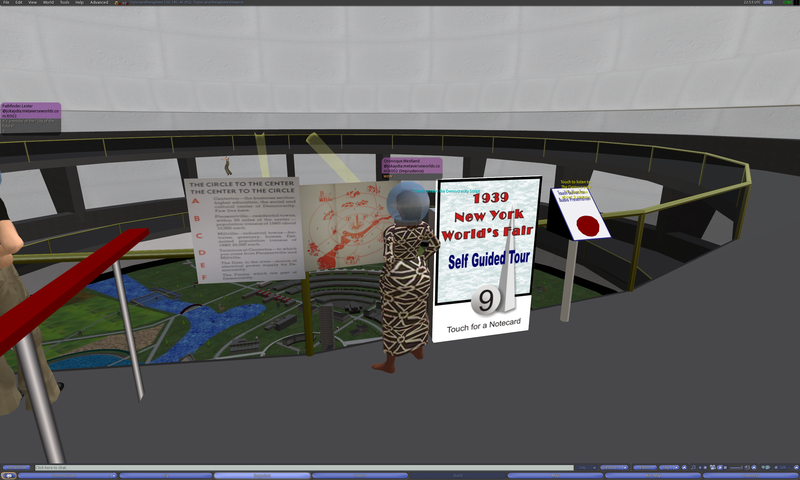 Pathfinder Lester: oh yes, the 3d aids quilt project. that will be a great event. Neo Cortex: I was wondering if we should plan some travles with the club starting in a hg 1.5 environment soon? 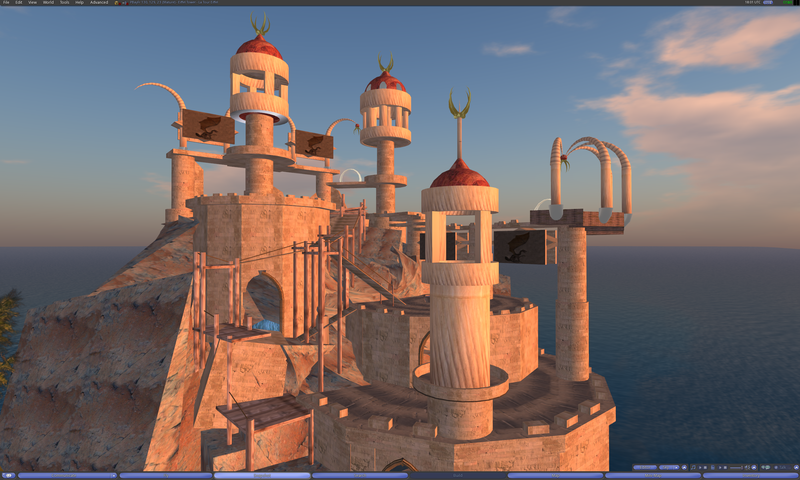 Jokay Wollongong: jokaydia are pretty close to having an outpost on the OSGrid..
Pathfinder Lester: Jokay, sounds like a great idea! Jokay Wollongong: i thought they were just about sorted out now Neo? Pathfinder Lester: Neo, that’s what I’ve heard. 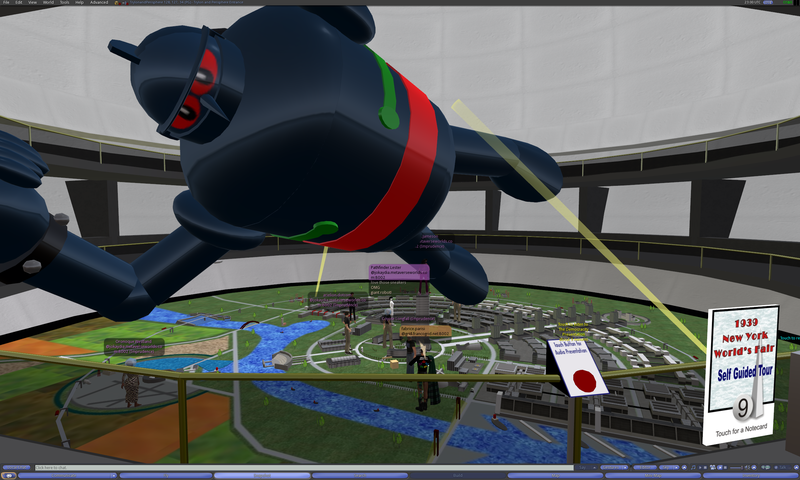 folks can’t HG jump out of OSGrid rightnow, is that right? Pathfinder Lester: Mel, i’m glad you mentioned that. I’ve been meaning to attend those meetings. Anastasios Aurotharius: Wright Plaza? in Jokaydia? Aloe Cortex: 11am gmt, mel? Pathfinder Lester: Neo, i agree. it’s really hard right now to try and jump across the Hypergrid because of the current incompatible versions everyone is running. Pathfinder Lester: Neo, ah, I think the permissions on the horse are a bit wonky. Pathfinder Lester: i’ll work on fixing them. ty for the reminder. Mel Blauvelt: Is there a beta grid for distributions? 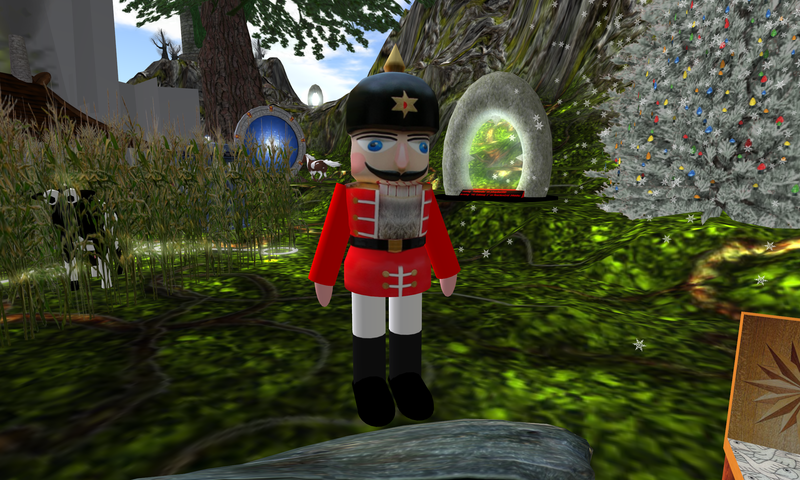 Pathfinder Lester: i believe the nutcracker behind me is fully copyable. if anyone wants a christmas decoration. Pathfinder Lester: i’ll definitely take you up on that offer in the future. Pathfinder Lester: Lex, do you want to tell people a bit about it now? Pathfinder Lester: Lex, do you want to tell people now a little bit about your new region? Pathfinder Lester: thank you Lex. I have also seen that you take great pictures. Pathfinder Lester: Neo, very true. Ange Menges: Lex, Your spanish grid is down ? Pathfinder Lester: hopefully someone will start one again. Pathfinder Lester: yes, I’m happy you found a good home! Pathfinder Lester: Lex, I will let you know if I discover any grids from Spain. We all walk through an instant Hypergate on the region Pathlandia on jokaydiaGRID. 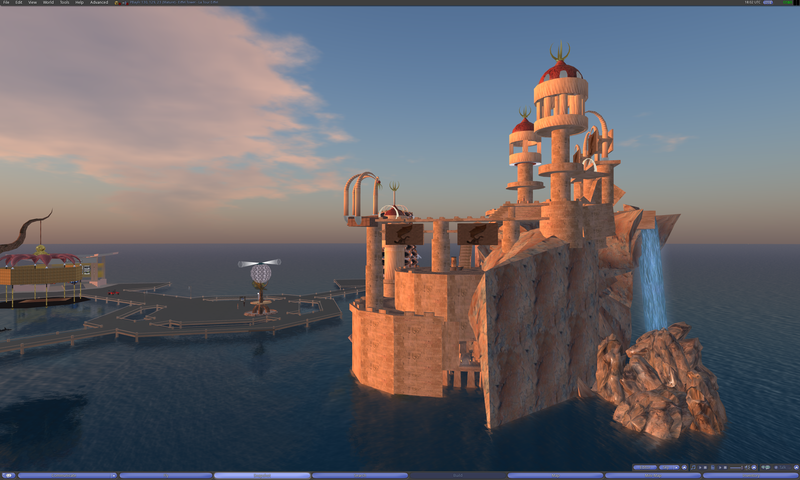 We make a manual Hypergrid jump and arrive on the region PBayFr on FrancoGrid. We had some bandwidth difficulty trying to bring all of our avatars to LexGrey’s region, since it was hosted from his home on a DSL connection. 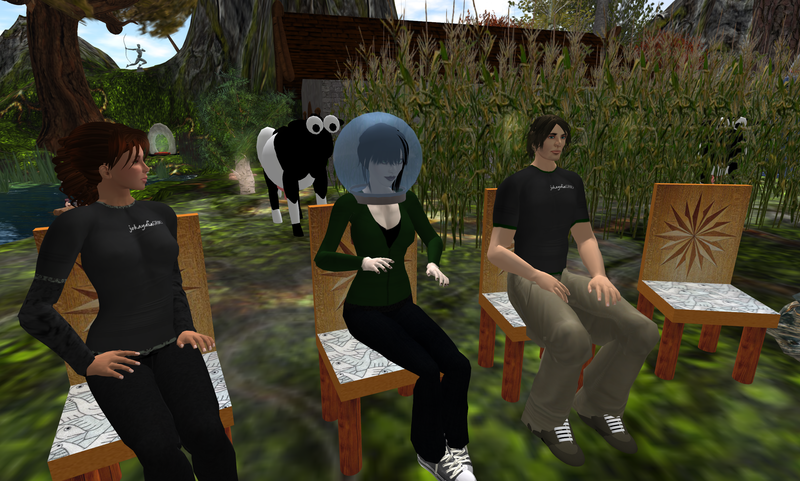 But in the end we all had a fun time pushing the limits of OpenSim and the Hypergrid! LexGrey, thank you again for your hospitality and for opening up your new home to visitors. Jokay Wollongong: hehe… people irl now call me by my vws name..
Pathfinder Lester: also, I think everyone here has met each other before…..so it might seem silly to type in intros…. Oronoque Westland: I teach Caribbean history, economic transformation and (soon) women’s studies. My project involves creating an immersive environment for my students to experience. “TrylonandPerisphere” is a recreation of the famous modernist buildings from the 1939 New York World’s Fair. Chimera Cosmos: Ari – you need to create a new shape and wear it so you can mod it – – have you done that? arielion dotcom: Oay, the creepy little thing wit the placard is supposed to be here, right? arielion dotcom: Thanks. I have only just started to eat healthy and thought I may have had a bad apple. arielion dotcom: Thanks. Judging from the way the cow is looking at me he sees something I don’t. Oronoque Westland: are you my winged friend Ari? Pathfinder Lester: ignore the cows. they are just looking for attention. Chimera Cosmos: making fancy avis is ALWAYS going to be beyond my pay grade! Jokay Wollongong: well who can blame them path.. they are getting usurped by squirrels and bunnies! Chimera Cosmos: so I’m friends with myself! 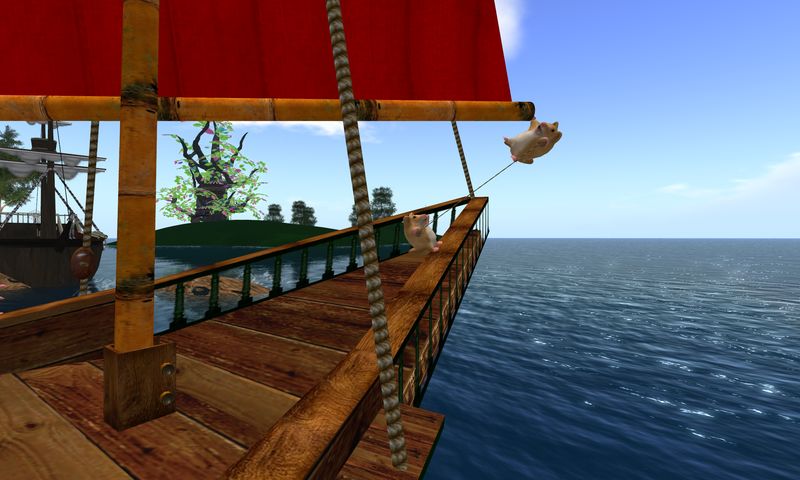 arielion dotcom: There may be a copyright issue with trying to get my avatar out of SL so I may have to try something different. I tired ot make myself lion-y but it dodn’t work. arielion dotcom: All I need to be able to do is paste my icon over my face but can’t do that either. Chimera Cosmos: Jokay, since I am the original estate owner of Sagacity (as Chimera) can Spiral get equal powers? Orchid Jameson: Has anyone brought over a Zhao or other AO? Chimera Cosmos: never been an estate owner before! Pathfinder Lester: Coyote, i see that sometimes too. but then eventually the avs seem to load. Chimera Cosmos: there are no better women than JOkay! Pathfinder Lester: jokay, are you…um….wearing a fishbowl on your head? arielion dotcom: I hope it’s not my breath. Pathfinder Lester: hyperhelmet! i love it. Pathfinder Lester: we should make up a rule for folks new to hypergrid jumping…..
Pathfinder Lester: “now, you MUST wear this HELMET. or your BRAIN will EXPLODE when you hypergrid jump. 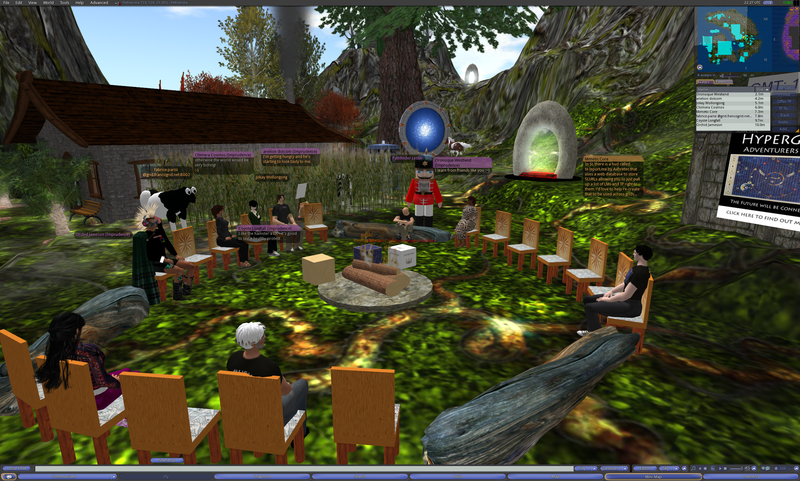 Orchid Jameson: can we get to Craft via hypergrid? Pathfinder Lester: I’ve never been to Craft-World. that’s an italian grid, right? Chimera Cosmos: when I read about it and couldn’t get there from here! Pathfinder Lester: that brings up a good point. if anyone ever discovers routes to new grids from here, please let me know and we can feature them on a future tour. Chimera Cosmos: both are german! Orchid Jameson: oh Path… May I have that note too? arielion dotcom: I’m just glad I’m not still stuck at the monastery from last trip. Here’s a link to our previous tour where we visited New World Grid and a beautiful monastery. 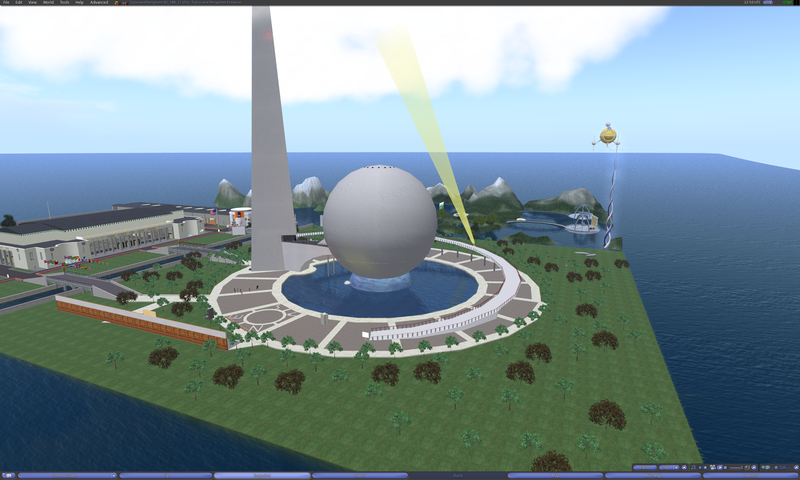 In that blog post you can learn how to visit New World Grid via the Hypergrid. Chimera Cosmos: didn’t we go there too though Path? Chimera Cosmos: yeah I was there – forgot which grid it was on! arielion dotcom: Yes, why isn’t Pathlandia on the list on Imprudence? arielion dotcom: Yes, I know but I mean the ldefault Imprudence list. Jokay Wollongong: on the login list in imprudence Arielion? Pathfinder Lester: arielion, you mean imprudence’s “grid list” thing? Orchid Jameson: Has anyone found an animation overrider like Zhoa? arielion dotcom: I scrolled but didn’t see it. I’ll tr again. this is my “home” so I may not need it. Oronoque Westland: @Jokay, is it possible to make that list alphabetical? arielion dotcom: Just thought it was strange not to see it. Oronoque Westland: @Jokay, is it possible to make that list of sims alphabetical? Pathfinder Lester: and leave any freebies there you’d like to share with folks, too. Jokay Wollongong: There were New World Grid peeps here earlier today looking for stuff there to add to their grid too..
Pathfinder Lester: Hyperica is a manually curated list of regions, so it relies on folks filling out that form. 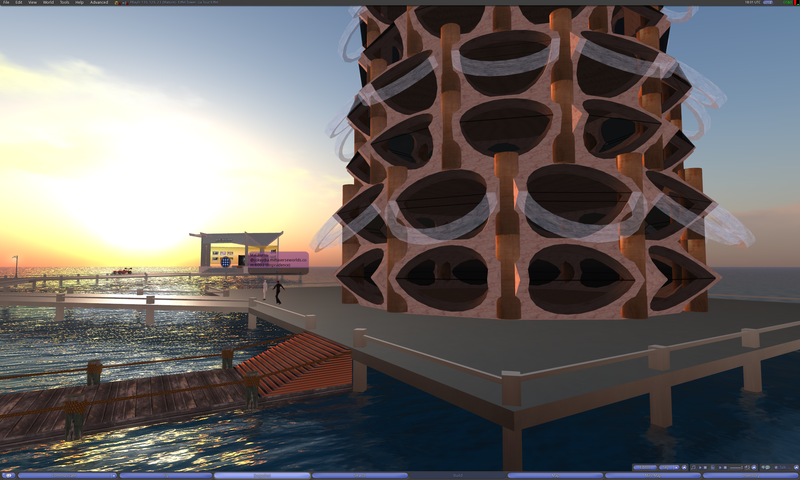 fabrice parisi: you know if hyperica have an inworld system to reference the sim ? Pathfinder Lester: fabrice, i do not think so. arielion dotcom: We come into these wholly created worlds then try to do it oursevles and thing. Yikes! arielion dotcom: I can’t type tonight. I blame the rarified atmosphere here. Pathfinder Lester: arielion, no worries. and we are all still learning how all this works, too. arielion dotcom: LOL. I’m afraid I’d never get it off. Pathfinder Lester: these meetings are a good place to share whatever we all learn, and to ask any questions. Pathfinder Lester: that would be great! Chimera Cosmos: otherwise the world would be very boring! arielion dotcom: I’m getting hungry and he’s starting to look tasty to me. 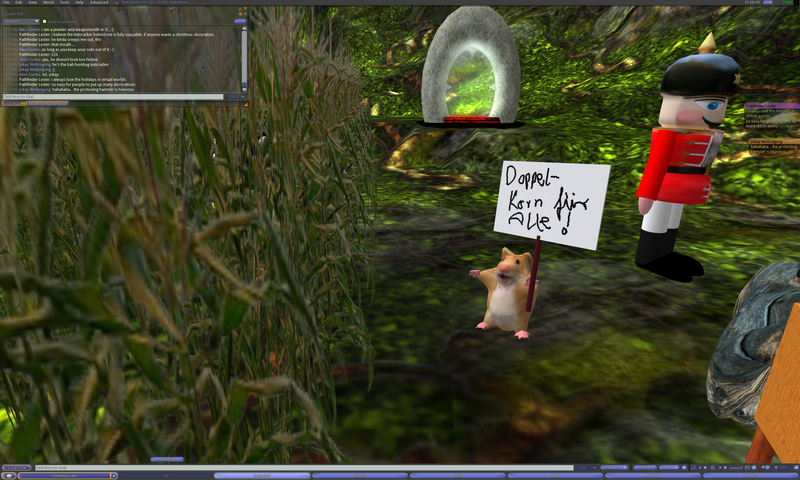 Chimera Cosmos: you could probably use one of the free teleport hud scripts from SL over here couldn’t you? Chimera Cosmos: to make one? arielion dotcom: I may not look like a lion but I still have lion-ish appetites. 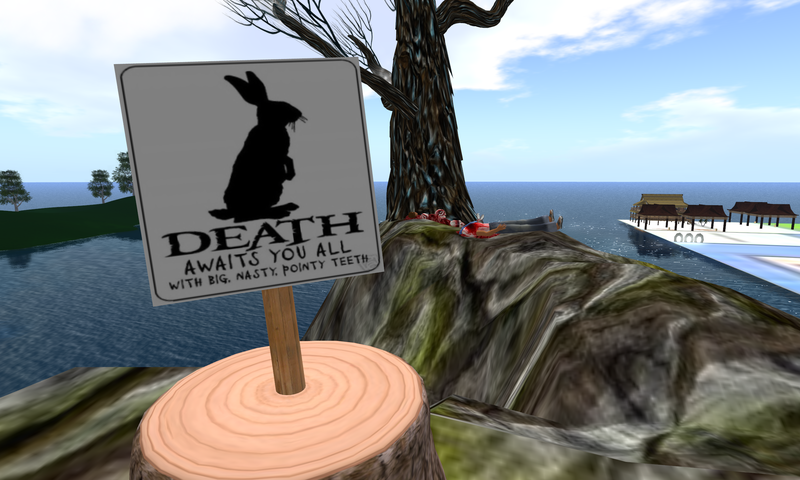 Pathfinder Lester: oh, the hobo freebies in SL are outstanding! 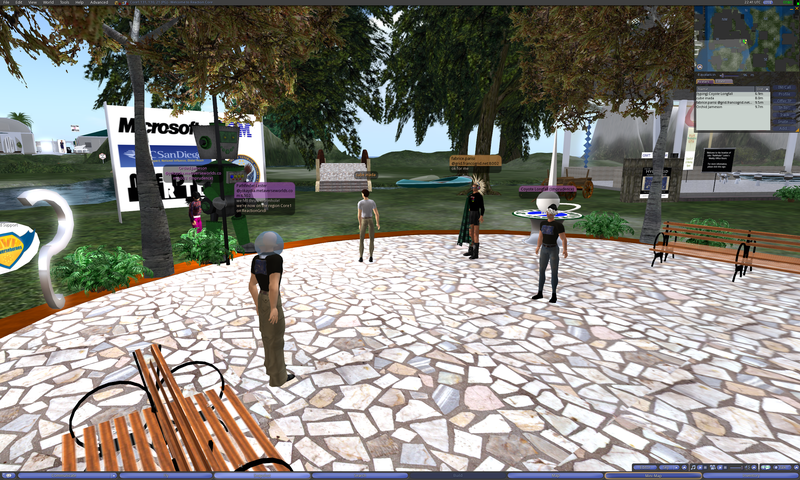 Orchid Jameson: yes the Hobos are a great resource..
Chimera Cosmos: I just like to put LMs in my inventory and search – but if I forget the sim name then….grrrr! Coyote Longfall: Did I miss introductions? Chimera Cosmos: I have a SL question. Can you still access your TP history all the way back to your Rez Day in Viewer 2? Pathfinder Lester: Coyote, jump right in if you want to introduce yourself. Pathfinder Lester: Chimera, good question. I don’t know. Pathfinder Lester: we’ll be making a manual jump to a region on ReactionGrid today. Jokay Wollongong: and one of the oldest builds on RG to right pathfinder? 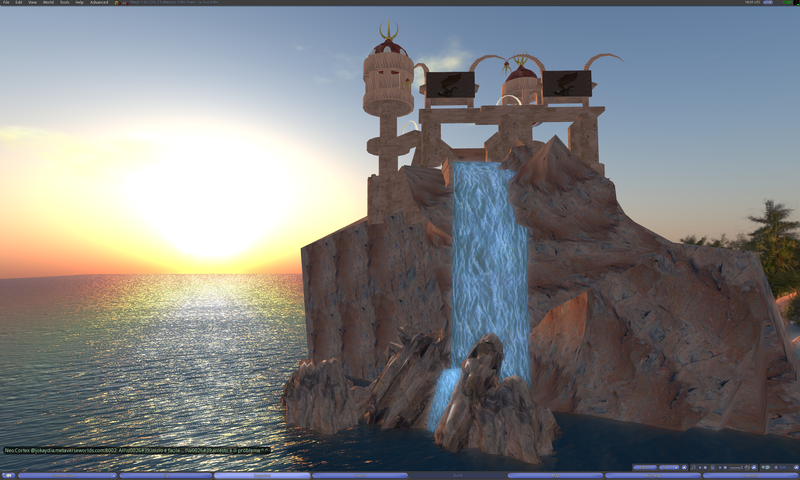 Pathfinder Lester: to highlight how folks could recreate RL archittecture in virtual worlds. Pathfinder Lester: so open your notecard. and you’ll see the details on how we’ll jump there. Some of us had problems trying to make a manual Hypergrid jump from the region Pathlandia, so we decided to make a local teleport to the region Scooter and then try hypergrid jumping from there. 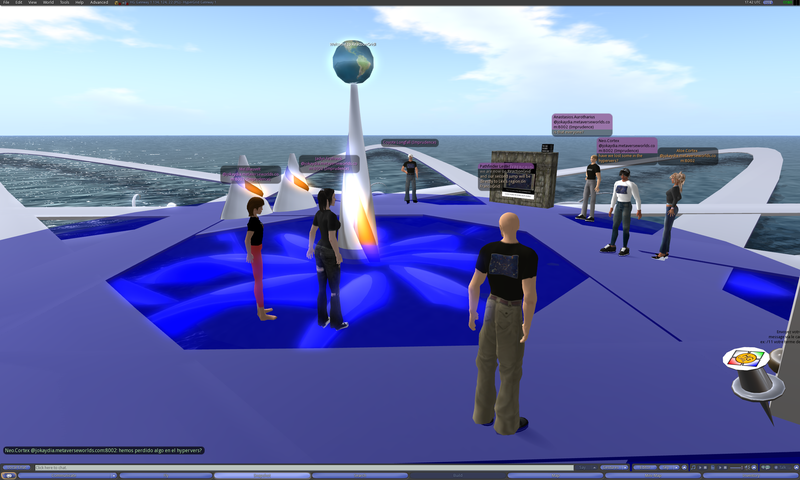 But while teleporting to Scooter we suddenly found ourselves hypergrid jumped to the region Core1 on ReactionGrid. Pathfinder Lester: we fell thru a wormhole! Pathfinder Lester: we’re now on the region Core1 on ReactionGrid! Pathfinder Lester: we fell thru the fabric of space and time. 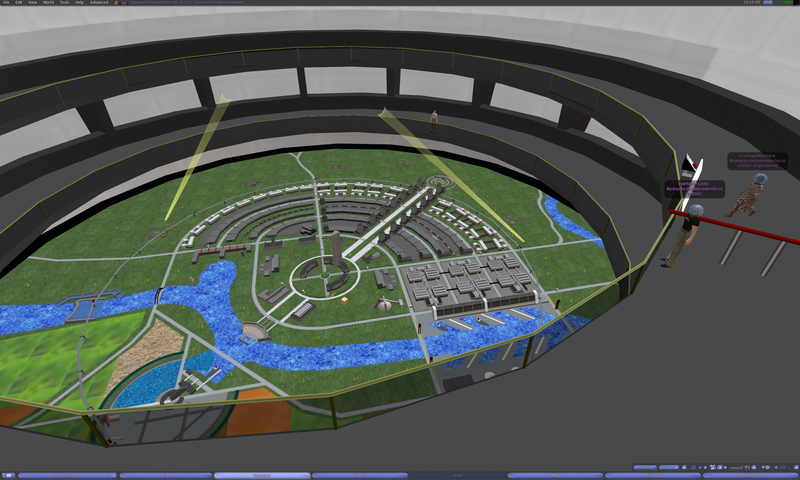 We make a local teleport on ReactionGrid to the region TrylonandPerisphere. Pathfinder Lester: this is the underground part of the build. Jokay Wollongong: *checks to make sure all of me made it*.. that was a bumpy ride! Chimera Cosmos: stomping on buildings! Pathfinder Lester: it’s all very organized, yes. Orchid Jameson: Orchid Against the ROBOT!! arielion dotcom: Where’s Astroboy when you need him? Orchid Jameson: banana throwers and the like..
arielion dotcom: Whao the little cars really move. I just noticed htat. Pathfinder Lester: yw arielion. great you could join us today! Pathfinder Lester: you did great, arielion. Pathfinder Lester: you made it to our final destination! arielion dotcom: Sure. It’s all fun and games until the hamsters picket and the robot starts dancing. Pathfinder Lester: ok, take care, folks. have a great rest of the day. hope this was fun for you. Pathfinder Lester: and hope to see you all again soon. Pathfinder Lester: and remember to always weary your Hypernaut Helmet! arielion dotcom: OK! Bye! See everyone soon I hope! This entry was posted in Hypergrid Adventurers Club, OpenSim, Virtual Worlds and tagged architecture, avatars, education, francogrid, Gaudi, HyperGate, HyperGrid, Hypergrid Adventurers Club, jokaydiagrid, metaverse, online communities, OpenSim, ReactionGrid, virtual worlds by John "Pathfinder" Lester. Bookmark the permalink. 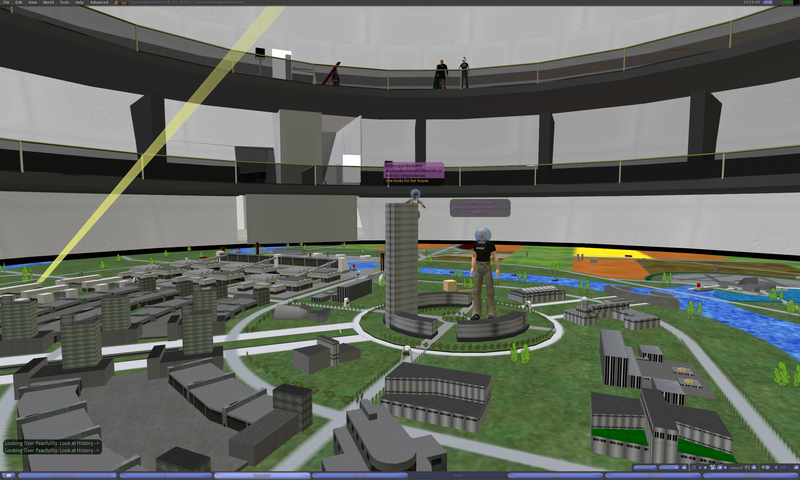 OSGrid is aware of the hypergrid teleporting problem, has a solution, and are working to implement it now. 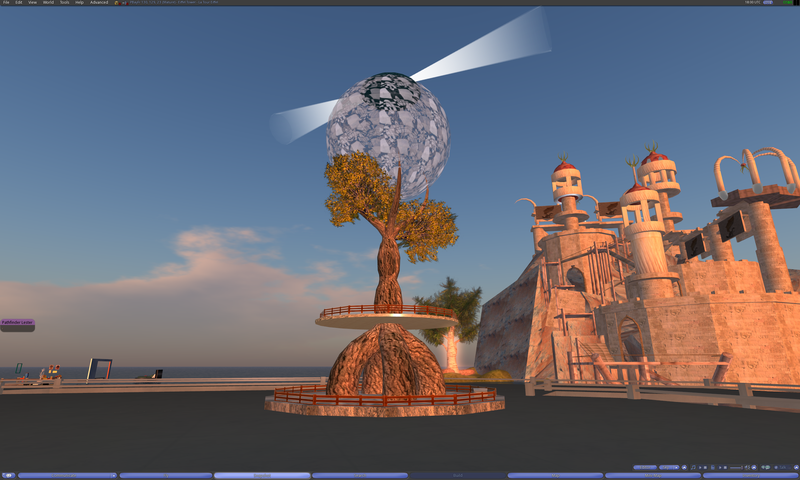 I’m hoping that hypergrid teleports will be working within a few days, since at my company we heavily depend on access to our OSGrid avatars. This is one of the risks of being way out on the cutting edge of development — problems might not become apparent until after you’ve upgraded everyone to the new code. ReactionGrid has a point about staying a version or two behind, and making sure that all the bugs are worked out before upgrading — but I’m impatient, I like getting all the cool new features as quickly as I can! I hear ya about wanting cool new features!